What a super appropriate title! It's Ashley here, blogging from my vacation because I totally forgot to post my blog! I was going to do it last night. Gah! I'm so sorry, but it's still Monday here on the West Coast, so I'm not really too late yet. I think. Oh, AWESOME sales happening in the Paper Maniac store! Please note this sale is only running TWO WEEKS so hurry! 10% off Memory Box, 20% off all inks, 30% off Northwoods Stamps, 40% off The Greeting Farm stamps, and 50% off SEI papers and embellishments! FABULOUS! It's rather funny that I made a card with Let's Catch Up with the sentiment when I always feel like I'm behind! I made this using the Card Patterns sketch for this week. The paper is MyMind's Eye Stella and Rose: Gertie. This might be my favorite Stella and Rose paper pad because of the yellow in it. I think it really pops. I used some My Mind's Eye clear stamps for this card with Memento Rich Cocoa ink (on sale). These stamps are FABULOUS! They stamp very well and are so inexpensive and cute! I used my Spellbinders Beaded Circles to cut the image panel. I finished with some ribbon, a doily and some Making Memories alphabet stickers. 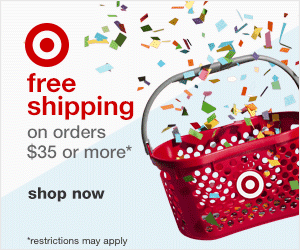 I love your fun & happy card!!!! Thanks for playing with us at Card Patterns! What a fun card! I love the doily. Isn't is so true though that we are always trying to catch up....I think we would be bored with life if it didn't keep us on our toes...it helps keep us motivated! soooo sweet! love this, Ash! Duper cute. Love the phone on the die cut out. It really stands out! Lovel card Ashley! 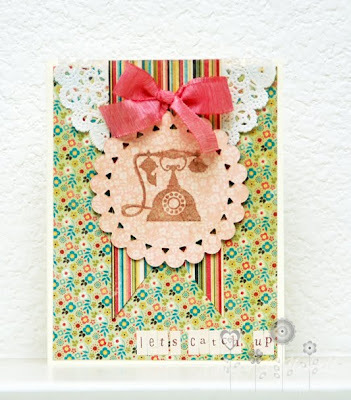 Love the bright and cheery papers and that retro telephone! Thanks for playing with us at Card Patterns!